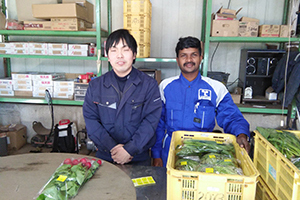 Peace Winds Japan (PWJ) believes in investing in staff training. Because training our staff creates much more positive impact to our projects as well as builds stronger self confidence. 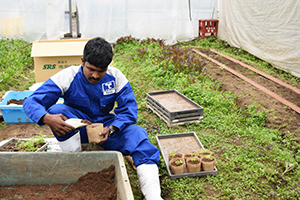 At our Sri Lanka Office, we send our local staff to Japan and learn about organic farming and farm to market methods and good practices, which has been proving to drive to a better understanding of our own project, and our beneficiaries benefit from sharing such experiences. Here’s a story of recent staff training. My name is Kaleeswaran, people call me Kalees. I am a Program Assistant at Peace Winds Japan (PWJ) in Sri Lanka office, where our team helps livelihood of dairy, vegetable and rice farmers in eastern area called Trincomalee. 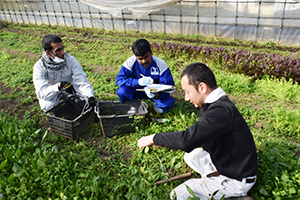 Recently, I had an opportunity to spend two weeks in Japan learn about organic farming focused on how to cultivate organic vegetables. 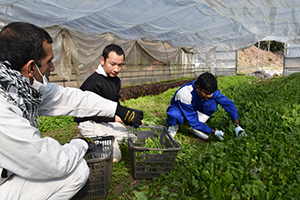 There are about four thousand organic farms in Japan and most of them are certified organic farms. 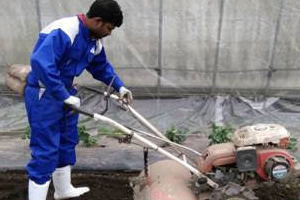 In Sri Lanka, organic farming is still a new concept. I met Mr. Tanabe from Tanabe Farm in Jinsekikogen in Hiroshima, it is one of the organic farms in the area where he has been growing over 30 varietals of vegetables as well as raising poultry organically since 1944. My two weeks stay at the farm was full of new experiences, and I learned various techniques of how to cultivate organic vegetables! Mr. Tanabe and his staff at the farm taught me about important techniques for organic farming 1) plowing the land 2) seeding 3) watering 4) harvesting, and 5) packaging. 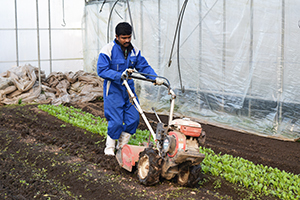 Plowing: I learned that plowing is very important for the cultivation process and how to walk with the plowing machine as well as how to handle it well. Seed Maintenance: Then, I learned about seed maintenance. 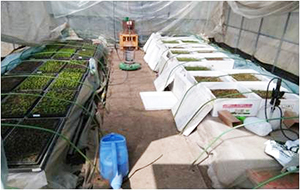 We need to handle seeds very carefully and it is important to maintain dry environment as well as monitoring the temperature for the seed storing. 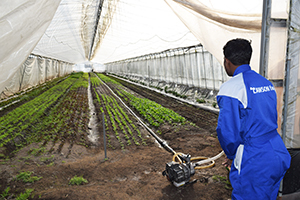 Watering: I also learned that the watering method and the amount of water is critical for cultivation. 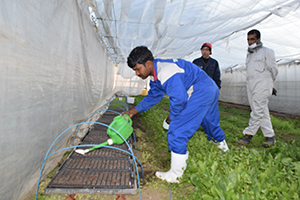 Harvesting: After watering exercise, Tanabe Farm staff showed me how to harvest correctly and clean the vegetables. 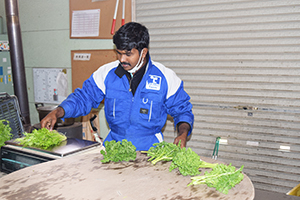 Packaging: Packaging vegetable to look attractive to consumers are also important part of the farming. Machine maintenance: You need to make sure to clean the machineries every time it is used. Also all the tools should be kept in a safe area. I am excited to bring back all the knowledge and experiences I had during my Japan visit and share them with my colleagues as well as farmers we support. I would like to thank Mr. Tanabe and all the staff at the farm, and everyone I met in Japan to make this trip a truly memorable. Programme Assistant, Sri Lanka Office.